Whether you are entering in order to test the level of your running ability, simply for the fun of enjoying the moment, surrounded by fellow fitness enthusiasts or your participation and training are all in a good cause, there is no doubt that organised events and their proliferation in the past few years have brought a new dimension to clocking up the miles. Far from being an often solitary pastime, running is increasingly seen as a participation sport that offers ordinary individuals the chance to get fit and make friends along the way. In terms of the UK, the most high-profile and prestigious event is the London marathon, usually run in April of each year. The general public has two routes open to them if they want to enter: firstly they can apply to join through the ballot, or secondly by applying to one of the charities that are allocated places every year by the race organisers. The popularity of the London marathon means it is difficult to secure a place, and like all races it requires a serious commitment from each individual, but there is no doubt that it represents an exhilarating if exhausting experience for everyone who is lucky enough to take part. The same is true of the Great North Run, held in the autumn on a half-marathon course linking Newcastle and South Shields. In common with the 26-mile event in the capital, entry is through a ballot system with additional places allocated to runners representing individual charities. The website also has information on a range of similar events, including those held in the cities of Manchester and Edinburgh. In addition to these high-profile races, runners will find a great many events, many organised in aid of charity, happening throughout the country during the course of each year. You will find that these will be a lot easier to gain entry to, although it is always best not to leave it too late. Any run that will involve liaison with the police or city council in order to organise traffic restrictions on the day of the race is likely to mean that the number of participants will be limited in order to calculate a specific amount of time that it will take for the runners to pass a particular point so that the roads can be reopened. 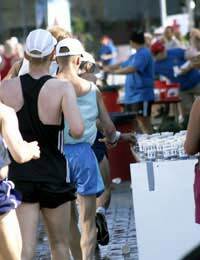 Individuals who are members of running clubs or organised running classes at their local gym will be kept in touch with forthcoming events, while it is always a good idea to keep one eye on the local press where you are likely to find either editorial or advertisements involving charities or companies eager to promote a race they are sponsoring. The same is true of children’s nurseries and hospitals, all of which have been encouraged by the fundraising potential of linking good causes to sports events. Of course, there is always the option of seizing the initiative, photocopying some sponsorship forms and gathering together some friends and neighbours to raise some money. Completing a few laps of the park will involve no headache in terms of course organisation and you may be instrumental in adding a few new members to the wider running community. So what are you waiting for?